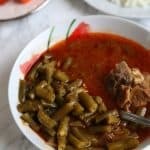 Authentic Middle Eastern green bean stew with meat. The beans and the meat are cooked in tomato sauce, then served with white rice on the side. To cook meat, place meat in a pot of water on high heat, let it boil, and remove any forming foam on the top. Let it boil for a couple more minutes. Remove meat from pot, and wash it. Set aside. Wash the green beans, remove the tips, and chop to 3 cm long pieces. In a frying pan heat corn oil, and fry the beans and sautee lightly for 4-5 minutes. In your Crockpot place the meat, 1 whole onion, the slightly cooked beans, salt, pepper, 1 bay leaf, and any spices desired (I add Bharat). And let it cook on high for 4-4.5 hours. (or on low for 8 hours). Add the mixture to the crockpot, and let it cook for 20 more minutes. Serve warm with white rice on the side.